From the history Channel, about ten or so years ago. Features Slotblog member Jim Cunningham. Thanks for posting, never on its last lap. I remember that episode. Seeing it again reminded me that there are home racers with tracks as well-sceniced as the model railroads. I had forgotten that one, Greg, thanks for posting. Funny, I raced commercial in '65, I think. The two most common cars at our raceway were the classic Manta Ray and the BZ Banshee. Thingies to the max! I was mostly racing at our local raceway in '66-68, and I don't remember seeing a lot of Thingies, although they definitely existed starting in' 65; when I worked there in the latter two years we did use Gar-Vic cars as rentals, although that probably wasn't a good idea! My impression is that '66 was the height of the commercial slot racing boom, and that involved a mixture of conventional models and Thingies - everything sold! While Jim's assertion that "Thingies" killed slot racing may be open to argument as a general proposition, it was certainly so in my case. My 30-year hiatus '64-'95 was triggered by my lack of interest in running my hardbodied scale models against things out of Saturday AM cartoons rolling on green or orange mini roller skate wheels. one. By fall '65 the races were mostly Mantas and Mako Sharks on Classic and Champion stamped chassis. While Jim's assertion that "Thingies" killed slot racing may be open to argument as a general proposition, it was certainly so in my case. Al, he wasn't asserting this: he says the manufacturers released the Thingies to try to counter the decline in the slot racing market, and given all the dates shown here, that's why I said it didn't compute: the Thingies were released right in the middle of the boom, and were arguably a big part of the mass market success of slot cars in '65-66 - they disappeared about the time slot racing began to go bust - and especially when real cars took on thingie like proportions! I don't think Jim was really agreeing that the Thingies killed slot car racing but he certainly does bring it up as an open question. In my case I think I started racing at commercial tracks in late '65. My first car was a Classic Viper, but as I recall I fairly quickly converted over to inline Dynamic chassis' with standard-of-the-day vacuum formed bodies like the Lotus 30 and Porsche F1/Indy, both by Pactra. When Champion came out with the inline wire frames I started using them ('66 time frame?) and quickly converted over to the Champion anglewinders when they hit the scene. Also by mid-late '67 I was building my own wire frames patterned after what I was seeing in the Model Car Journal newspaper. I may be wrong here but I seem to remember seeing the Choti "Thingies" showing up around that timeframe. I don't remember there being a rift between any factions at our raceway as I recall everyone just wanted to race what was the fastest. Then in late '67 or early '68 our local track closed and that was it for slot racing for me. I rediscovered it in the mid 90's when I lived in Fresno, CA, and have been racing since then. Probably a pretty typical story for many of us here. 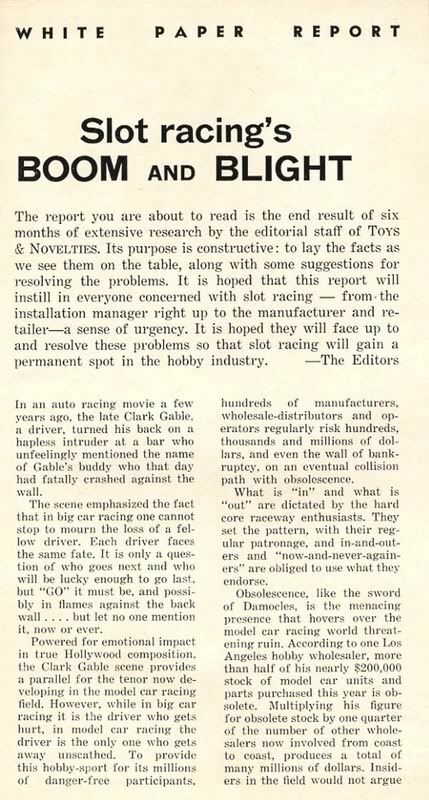 "By the late 60s slot cars had really reached a peak..(...) but interest started to wane, so the manufacturers looked for another way to appeal to the racers, and they came up with the Thingie..."
This is all patently wrong. The peak of slot cars as a whole was probably more like 1965, from the limited figures I've seen in trade magazines; and perhaps '66 for purely commercial slot racing - the year was not as good overall in general. The bust is generally agreed to have started in '67, with massive closings of raceways, but in fact large numbers had always closed down, but for a short while even more opened! Luckily that wasn't the case with most, and commercial slot racing had a resurgence, in the late's 80's and especially early 90's. In the meantime you missed 31 years of fun. things out of Saturday AM cartoons rolling on green or orange mini roller skate wheels. In the meantime, you violated one of Greg/Cheater's pet peeves, and one that I agree with. Going out of your way to demean other types of slot racing you don't like. "Going out of your way, to demean other types of slot racing, you don't like." Not demeaning, describing my reaction and why, for me, slot racing was gone until I had room to build my own home track and then find other hobbyists similarly inclined. The first time I can recall seeing a King track was at RadTrax in Las Vegas in 1999. Racing scale 1/32 cars on it was not particularly enjoyable. I was much happier the next year when Jon had installed a 6 lane modified figure 8 track that was perhaps 70' long. "things out of Saturday AM cartoons rolling on green or orange mini roller skate wheels." Would it have been preferable to use the term "Thingies"? You used 3 words to, not one of them negative, to describe the type of cars you prefer, but 15 words, some of them negative, to describe the cars you dislike. When you add in an inaccurate comment about the color of the wheels (plenty of thingies came with big, black tires) IMO, your statement was uncalled for. Remember, this is called "Slotblog", not "Only Slot Cars you Prefer 'blog." In the early days of local slot racing, 64/65 at our local track, thingies were always a choice by a few guys. Some of these guys could take nice Cox hard body and butcher it till you couldn't figure out what it started life as. I would call those cars thingies! This type of stuff did not cause a war or make me quit racing. It did make me and a few other guys that ran somewhat scale looking cars, push for certain rules in our organized weekly races. We wanted and got rules requiring all cars except F1 and Indy cars to have tires inside the body, minimum body height, and any open car had to have a driver. At that time we had no rules regarding tires as no little bitty tires were available at our track. We all got along, but we did want all cars to look like something that met those minimum requirements. Of course during open track time, it was run what you brung. Over the years (50 or more now) I have embraced most all types of vintage slot cars and appreciate them all for what they are. Nothing compares to the scale appearance and quality of a Cox or MPC hardbody car. Nothing looks as fast as a Banshee or Stinger on the track! We all know the demise of slot cars in the late 60's was due to several factors as we have discussed a million times. I just watched the whole segment. How could of the Manta Ray been the biggest seller of all time if it was created to save a declining market? Slot racing died because 1/24 commercial racing, on big tracks with the floor space needed, is an incredibly bad business model. Once the fad wore off, where every teenage boy wanted a slot car, regardless if they were a fledging "car guy, or not, and the lanes weren't filled anytime, other than a Saturday afternoon, it was sunk. No argument with the sentence above, but 155'-220' foot tracks should not have been promoted as a necessary part of the 'formula,' as was basically the case. Again, I don't disagree with this statement, but what was missing the promotion of any reasons for (casual or not) participants to continue to be involved in the hobby. Consider how big a fad skateboarding was in the '70s and consider where that hobby/sport is today, with a fair number of skateboarding parks around the country and probably more people involved than in slot cars. I totally disagree with the term "fad" applied to slots. "Fad - A fashion that is taken up with great enthusiasm for a brief period of time; a craze." 60 years is not a "brief period of time." I think he pulled the "best-selling slot car" and "invasion of the Thingies" info out of thin air. Cool video nonetheless. No such thingie as "bad press." It hasn't been 60 years of super popularity, especially with commercial raceways. OK, Now here is a sociologist take on the matter. I raced rail and tether cars in the 1950s (as a kid). The first slot track I had was the first Scalextric and long shaft Strombecker sets. The City of Aurora, IL, had two hobby shops in 1960 and a group of us built a 80-100' scale track in the basement of one – Aurora Cycle and Hobby. They ultimately had a dragstrip and a used Amercan Queen by 1970. We raced scale 1/32 and 1/24 cars like we watched at the local Meadowdale and Road America racetracks and Chicago area dragstrips. My best cars were a Cox Chappareal and a Monogram Cobra. I have collected the parts to restore/recreate the Cobra. I kept the motor and frame with the 1/8" lead ballast under it. Factory 'stock' is only a starting point to make a race car. Christmas 1965 the Aurora area got its first 'commercial' raceway after six other one track (all road courses) storefront existed. Guess what – that is also the time the Vietnam war was drafting everyone and most of them were the slot race customers. No racers and everyone's concerned more about 'The War' and Nixon. Everyone I raced with and served with either had other interests and GI Bill college to keep them occupied. That 'Big Wheel Revell Raceway' became the headquarters for the new community college and most of the small storefronts changed their profit centers and rentors. Yes, the manufacturers bid for building better slot cars every month created a lot of obsolete cars and part – many of which we still buy today. The abilty to 'keep score' with a computer was not practical until the 286 series computer and SRT software around 1990. Standardizing the racing rules in 1972 with the NCC and other groups created a parameter to build standardized cars that woud be less likely to become obsolete. Skateboards.....pet peeve of mine. In the 1950s the lawyer shutdown the craftshop at the YMCA where we had jigsaws and sanders and other tools to make pinewood derby, dollhouses, etc. They claimed a 'liability issue'... The younger brother of a close friend of mine had a pre 1960 skateboard. Flat sidewalk it slide out from him and he fell flat on his back crushing the back of his skull - brain dead in hours. The industry has improved the boards with suspension and better wheels, but the park districts are using our tax monies to build the broken bone factories they call 'skate parks' and the slot racer has to pay though the nose to rent commercial space for a safer hobby and learning experience. What are these morons thinking about other than to make big bucks off a kids misery?